Journalists at Le Monde are working to prevent Czech energy billionaire Daniel Kretinsky from taking control of the iconic publication, widely considered to be France’s newspaper of record. A deal is being hammered out among shareholders and representatives for the publisher and editorial staff, unnamed sources told the Financial Times. France has a long history of seeking to preserve its culture and institutions, including media properties like Le Monde. Its protectionist measures have capped the import of Hollywood movies into Europe’s biggest film market, leading to a thriving black market for DVDs of foreign movies. The battle for Le Monde started in October when Lazard banker Matthieu Pigasse unexpectedly sold 49% of his interest in the newspaper’s publisher to Kretinsky, who also owns the AC Sparta Prague soccer team. Le Monde’s circulation has hovered near 300,000 for the past five years, down from about 410,000 in 2002. However, the number of digital subscribers have surged more than fivefold since 2010. It is now 180,000. Paul Benkimoun, a medical reporter who leads a group representing the newspaper’s editors, said the biggest concern is any shareholder who may try to exercise control of the publication, not just Kretinsky. 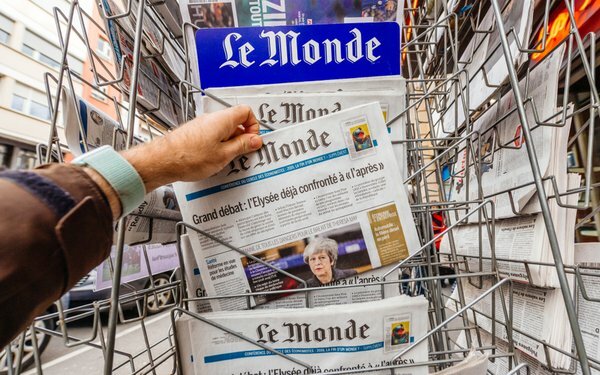 Le Monde was on the verge of bankruptcy in 2010 when Lazard’s Pigasse, telecom billionaire Xavier Niel and the late Pierre Bergé bought a controlling interest in the company. Employees backed their buyout plan, which included recapitalizing the company. They also created a group to represent journalists, employees and readers that owns one-fourth of the company. The group, along with Le Monde’s publisher, Louis Dreyfus, and Niel are working on a deal to gain the legal right to approve a new controlling shareholder. Kretinsky created Czech Media Invest in 2011 to focus on buying managing media properties in Central and Western Europe. Last year, CMI bought several French titles from media group Lagardère, including the weekly Marianne, Elle, Télé 7 Jours, Ici Paris and France Dimanche. Le Monde’s new shareholder agreement may have a lasting effect on how politically sensitive businesses, such as national newspapers, are owned and operated in France. Nationalist sentiment has become more pronounced in many European countries in the past decade. Disagreements over financial bailouts of European Union member states after the 2008 financial crisis, coupled with a massive influx of immigrants from the Middle East and Africa, have strained political ties in the region.